PennsylvAsia: Sennan Asbestos Disaster (ニッポン国VS泉南石綿村), winner of 2018 Pittsburgh Japan Documentary Film Award, free at Pitt on September 27. 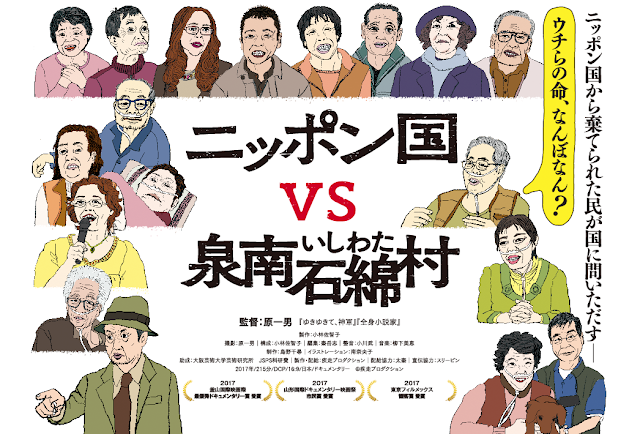 Sennan Asbestos Disaster (ニッポン国VS泉南石綿村), winner of 2018 Pittsburgh Japan Documentary Film Award, free at Pitt on September 27. The first-ever winner of Pitt's first-ever Pittsburgh Japan Documentary Award, Sennan Asbestos Disaster (ニッポン国VS泉南石綿村), will screen on September 27 in Oakland. More than ten years in the making, Sennan Asbestos Disaster follows a dwindling group of dying former asbestos workers as they seek justice and recognition from an indifferent Japanese government As Mr. Hara follows these plaintiffs through their successes and failures, his film also examines the power of the Japanese state and its continued responsibilities to its citizens. In praising the film for its profound effect, Mr. Soda notes that Sennan Asbestos Disaster “shows the painstaking process of the eight years of lawsuits. I was able to physically experience what it's like to fight against the Japanese government.” Mr. Hara, whose previous works include The Emperor’s Naked Army Marches On (1987), is well known for being unafraid to punch through walls of conventional society. Sennan Asbestos Disaster has already received the 2017 Audience Award at the Tokyo Filmex International Film Festival and the 2017 BIFF Mecenat Award at the Busan International Film Festival. The movie starts at 6:00 pm at the Frick Fine Arts Auditorium in Oakland (map). The screening is free but tickets are required (and can be reserved online).